For more than 30 years albatross was not too strong a word to describe Playa Vista, the massive land parcel just west of Culver City that has been a source of frustration and failure for developers envisioning a planned community of houses, shops, and offices. Between shaky finances and determined opposition from environmentalists, the place was practically kryptonite in the world of L.A. real estate. But timing and opportunity can work wonders. The residential side, which opened in 2002, is becoming a full-fledged neighborhood (more than 200 babies were born there last year), and now the commercial area to the east is finally showing signs of life. The success stems in part from the resolution of years-old lawsuits that sought to protect the Ballona Wetlands, a portion of the property that’s a haven for plants, birds, and other wildlife. Another factor, of course, has been a rebounding economy and with it, the strength of Playa’s current landowners. But what’s happening mostly reflects the growth of L.A.’s hybrid technology sector, a collection of software firms, Web-based designers, special-effects businesses, ad agencies, video game publishers, and entertainment production companies. Loosely concentrated in Santa Monica, Venice, El Segundo, Culver City, and increasingly Playa Vista, the convergence of companies is what boosters have been dubbing Silicon Beach. Now, to be clear, the idea that L.A. can begin to compete pound for pound with Silicon Valley is wishful thinking in the extreme. It’s true that technology has represented a decent slice of Southern California’s economy, but until recently the companies typically have been small and humdrum (think test equipment and medical software developers). Also, they were never located in a central area, making them virtually invisible in a region as large as Los Angeles. Without major corporations like Apple or Hewlett-Packard, L.A. always lacked the foundation of a full-bodied technology center. What has formed, however, is an assemblage of digital businesses near the beach that seem to work well together. For example, an Internet marketing firm could require the services of a special-effects producer, or a software house might be retained by a games developer. “This is a spot where we saw a creative world developing,” says Liam Collins, head of YouTube Space L.A., as he leads me on a tour of the 41,000-square-foot production facility that Howard Hughes used as an airplane hangar in the 1940s. Last year’s decision by YouTube owner Google to lease space in Playa Vista legitimized the location in a way no developer’s sales pitch ever could. Google realized as much in negotiating a sweetheart lease with Wayne Ratkovich, whose real estate firm paid $32.4 million in 2010 for the 11 buildings that at one time were owned by Hughes. “It made us look like heroes, no question,” says Ratkovich. Open for six months, the YouTube space serves as a TV incubator for operators of online channels who want to profit from their work. They’re given access to sophisticated soundstages, screening rooms, and editing bays that are leagues above the bedrooms and garages where much of their content has been produced. After several weeks of training and consultation, the visiting programmers are replaced with other YouTube talent. “The technology companies want to get closer to creativity, and the creative companies want to get closer to technology,” says John Boiler, chief executive of 72andSunny, a rapidly growing advertising agency that’s about to move onto the Hughes campus, only steps from YouTube. History is certainly a selling point. During the renovation of what had been Hughes Aircraft’s main building, construction crews pulling out a piece of drywall discovered an old Pan American Airways map that had been used to plan the routes for TWA, which was owned by Hughes. Scheduled to take over the space in May, 72andSunny wrote into its lease that it would keep the map. Also being restored is Hughes’s wood-paneled corner office (imagine a law office from the 1950s), along with a walk-in safe that housed classified blueprints of Hughes aerospace products. “I swear, the ghost of Howard Hughes is hanging around here,” Ratkovich says inside the 275,000-square-foot hangar where Hughes’s Spruce Goose airplane was constructed. In recent years the space has been used as a giant soundstage for the films Titanic and Avatar, among many others. With his purchase of downtown L.A.’s Oviatt Building more than 30 years ago, Ratkovich, who also owns the Wilshire Boulevard offices of Los Angeles magazine, has a special interest in restoring older properties. “We learned a long time ago to celebrate history and market it,” he says. David Binswanger is an executive with Lincoln Property Company, one of the developers that purchased land in Playa Vista several years ago. The centerpiece of Lincoln Property’s effort is a 225,000-square-foot retail center called the Runway, which will have restaurants, shops, a movie theater, a drug store, and a supermarket—many of the conveniences Playa has been lacking. Showing me a model of the complex, Binswanger points to the ways in which his company is trying to replicate an un-planned neighborhood like Venice’s Abbot Kinney Boulevard (without the parking hassles). “We have the good stuff you want, but we also hope to have a natural, organic, communal feel,” he says. Lots of trees, sitting areas, pedestrian-friendly streets, outdoor cafés; one day it might resemble a real shopping area on a real street. Howard Hughes was certainly not thinking about a planned community in 1940 when he began buying 1,300 acres along the Westchester bluffs in a series of transactions. The nation was about to go to war, and Hughes wanted to get in on lucrative defense contracts (the military preferred Lockheed’s P-38 fighter plane over Hughes’s D-2 aircraft). The original headquarters of Hughes Aircraft Company was composed of several modest buildings used to manufacture parts and assemble aircraft, along with a private grass-and-dirt airstrip Hughes claimed was the longest in the world. Most of the land, however, was left untouched—his primary interest was keeping people away from his planes. After Hughes died in 1976, Summa Corporation, the company that held Hughes’s business interests, announced an ambitious plan to turn the parcel into an expanse of hotels, single-family homes, and a golf course. The California Coastal Commission signed off on the proposals, but then came a swarm of challenges from local environmental groups. Summa sold the land to Maguire Thomas Partners, which eventually defaulted on its payments (if you can’t build and lease, you don’t have the money to pay off your lenders). That left a group of banks and pension funds holding the property. Steve Soboroff, the peripatetic civic leader who was hired by Playa’s investors in 2001 to kick-start the project, says that a big mistake was treating the development as a pure real estate play instead of as a broader public-private initiative. “They didn’t care about the environmental groups, didn’t care about the neighbors, didn’t care about the politicians, and didn’t care about the media. To them it was a real estate deal,” he says in his Santa Monica office, handing me a to-do list that he had prepared on accepting the job. “Making traffic work,” “creating a great park system,” “respecting the environment,” and “being a great neighbor” were among the priorities. Soboroff helped resolve the environmental standoff (albeit not to everyone’s liking) and oversaw the residential component, much of which was located in a less sensitive area. Today it’s made up of 3,200 town houses, condos, lofts, and apartments that have varied looks because different sections were designed by different builders. Another 2,000 units are expected to go up in the next few years. An elementary school that’s focused on science and math opened last year, and there’s a public library, a fire station, and an eight-acre park. “The infrastructure is like a magnet for people who work in those companies,” he says. That’s been the idea from the start—residents being able to live and work in the same locale. The initial vision involved DreamWorks SKG, which in 1995 announced grand plans for a studio complex on virtually the entire swath of commercial property, and on very generous terms. But following countless delays and squabbles, DreamWorks realized that a major real estate investment was sort of a dumb move for an entertainment company. Its decision to back away was devastating, not only because several years of planning had been wasted, but because instead of a single commercial entity, developers would need to attract many tenants in a less glamorous business-park setting. That didn’t really work, either: In 2008, Fox Interactive Media, a unit of Rupert Murdoch’s News Corporation empire, signed a 12-year lease for more than 400,000 square feet, a deal that would have brought the social media site MySpace and other Fox digital properties under one roof. However, with MySpace turning into a disaster and later being sold in an embarrassing fire sale, Fox retreated. Around that time the company owning the land, Tishman Speyer, defaulted on its payments and had to surrender the office property. As the recession brought down commercial rents in more desirable markets on the Westside, the place was nearly left for dead. Well, except that Playa still had a colossal amount of entitled property in an area of Los Angeles where most land had been spoken for. Following the Tishman Speyer foreclosure, three developers snagged acreage on the cheap: Ratkovich; Lincoln Property, which is developing the retail center and paid 14 cents on each dollar of Tishman Speyer’s original purchase price; and Tishman itself, which reacquired some of the land it had foreclosed on. Binswanger, who has delivered the Lincoln Property sales pitch more than 100 times to prospective tenants, says that “the last thing they ask is, ‘Where do I go for happy hour?’ or ‘Where do I go for dinner?’ ” In another year and a half, when Playa’s shopping center is scheduled for completion, the answers will be evident. 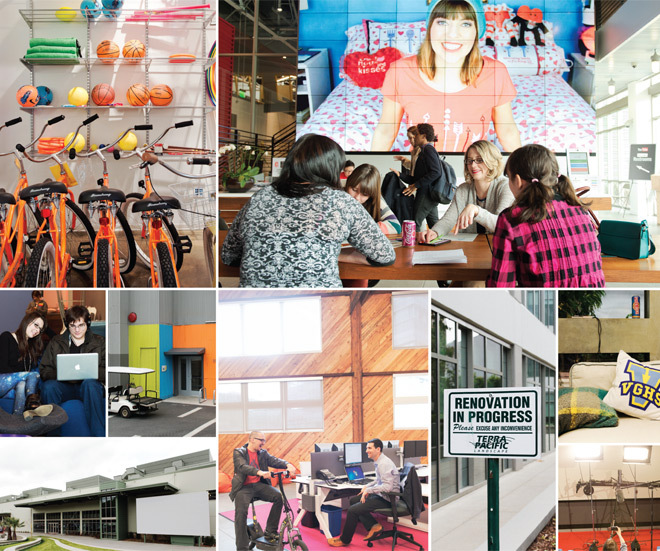 By then there should be other signs of a lived-in business district, with young workers borrowing company bikes for trips to the beach, dogs lounging under the desks of their owners, and movie and TV crews working inside the Spruce Goose hangar. “It seemed like a concept that would never happen,” says Brainard, “but here we are, a decade and a half later, and it’s happened. It has teeth, it has traction, it has credibility.” One of these days Playa Vista might actually be considered cool, a notion Howard Hughes could hardly have imagined.